Notable performances were made by the two debutants Portugal, ending third, and North Korea, getting to the quarter finals after a 1–0 win against Italy. Also notable was the elimination of world champions Brazil after the preliminary round and the fact that all four semi-finalists were European, a situation occurring in only four other World Cups (1934, 1982, 2006 and 2018). Portugal's Eusébio was top scorer with nine goals. The final is remembered for being the only one with a hat-trick and for its controversial third goal awarded to England. Prior to the tournament the trophy was stolen, although it was later recovered. The final, held at Wembley Stadium, was the last to be broadcast in black and white. The tournament held a FIFA record for the largest average attendance until it was surpassed by Mexico in 1970. It was boycotted by most independent countries from Africa who objected to the qualification requirements. Despite this, the number of entries for the qualifying tournament was a new record, with 70 nations. England was chosen as host of the 1966 World Cup in Rome, Italy on 22 August 1960, over rival bids from West Germany and Spain. This is first tournament to be held in a country that was affected directly by World War II, as the four previous tournaments were either held in countries out of war theatres or in neutral countries. Despite the Africans' absence, there was another new record number of entries for the qualifying tournament, with 70 nations taking part. After all the arguments, FIFA finally ruled that ten teams from Europe would qualify, along with four from South America, one from Asia and one from North and Central America. Portugal and North Korea qualified for the first time. Portugal would not qualify again until 1986, while North Korea's next appearance was at the 2010 tournament. This was also Switzerland's last World Cup finals until 1994. Notable absentees from this tournament included 1962 semi-finalists Yugoslavia and 1962 runners up Czechoslovakia. The Portuguese colonies of Angola and Mozambique participated for Portugal. These colonies only got their independence in the 1970s, while most other African colonies became independent in the 1960s. 1966 was a World Cup with few goals as the teams began to play much more tactically and defensively. This was exemplified by Alf Ramsey's England as they finished top of Group 1 with only four goals, but having none scored against them. They also became the first World Cup winning team not to win its first game in the tournament. Uruguay were the other team to qualify from that group at the expense of both Mexico and France. All the group's matches were played at Wembley Stadium apart from the match between Uruguay and France which took place at White City Stadium. In Group 2, West Germany and Argentina qualified with ease as they both finished the group with 5 points, Spain managed 2, while Switzerland left the competition after losing all three group matches. FIFA cautioned Argentina for its violent style in the group games, particularly in the scoreless draw with West Germany, which saw Argentinean Rafael Albrecht get sent off and suspended for the next match. In the northwest of England, Old Trafford and Goodison Park played host to Group 3 which saw the two-time defending champions Brazil finish in third place behind Portugal and Hungary, and be eliminated along with Bulgaria. Brazil were defeated 3–1 by Hungary in a classic encounter before falling by the same scoreline to Portugal in a controversial game. Portugal appeared in the finals for the first time, and made quite an impact. They won all three of their games in the group stage, with a lot of help from their outstanding striker Eusébio, whose nine goals made him the tournament's top scorer. The quarter-finals provided a controversial victory for West Germany as they cruised past Uruguay 4–0; the South Americans claimed that this occurred only after the referee (who was Jim Finney, from England) had not recognised a handball by Schnellinger on the goal line and then had sent off two players from Uruguay: Horacio Troche and Héctor Silva. It appeared as though the surprise package North Korea would claim another major upset in their match against Portugal at Goodison Park, when after 22 minutes they led 3–0. It fell to one of the greatest stars of the tournament, Eusébio, to change that. He scored four goals in the game and José Augusto added a fifth in the 78th minute to earn Portugal a 5–3 win. Meanwhile, in the other two games, Ferenc Bene's late goal for Hungary against the Soviet Union, who were led by Lev Yashin's stellar goalkeeping, proved little more than a consolation as they crashed out 2–1, and the only goal between Argentina and England came courtesy of England's Geoff Hurst. During that controversial game (for more details see Argentina and England football rivalry), Argentina's Antonio Rattín became the first player to be sent off in a senior international football match at Wembley. Rattín at first refused to leave the field and eventually had to be escorted by several policemen. After 30 minutes England scored the only goal of the match. This game is called el robo del siglo (the robbery of the century) in Argentina. All semi-finalists were from Europe. 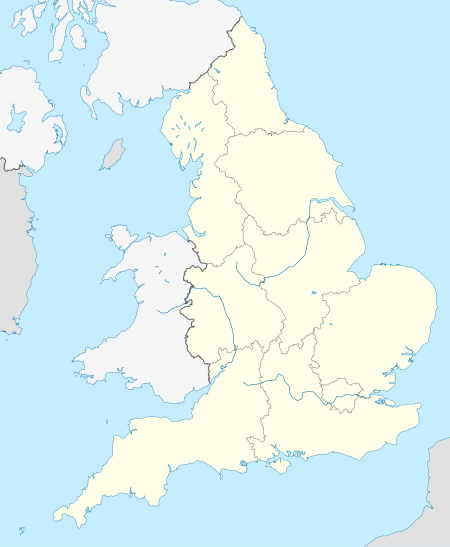 The venue of the first semi-final between England and Portugal was changed from Goodison Park in Liverpool to Wembley, due to Wembley's larger capacity. This larger capacity was particularly significant during a time when ticket revenue was of crucial importance. Bobby Charlton scored both goals in England's win, with Portugal's goal coming from a penalty in the 82nd minute after a handball by Jack Charlton on the goal line. The other semi-final also finished 2–1: Franz Beckenbauer scoring the winning goal with a left foot shot from the edge of the area for West Germany as they beat the Soviet Union. Portugal went on to beat the Soviet Union 2–1 to take third place. Portugal's third place remains the best finish by a team making its World Cup debut since 1934. It was subsequently equalled by Croatia in the 1998 tournament. London's Wembley Stadium was the venue for the final, and 98,000 people attended. After 12 minutes 32 seconds Helmut Haller put West Germany ahead, but the score was levelled by Geoff Hurst four minutes later. Martin Peters put England in the lead in the 78th minute; England looked set to claim the title when the referee awarded a free kick to West Germany with one minute left. The ball was launched goalward and Wolfgang Weber scored, with England appealing in vain for handball as the ball came through the crowded penalty area. 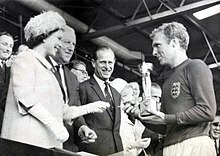 Elizabeth II presents the Jules Rimet Trophy to England's team captain Bobby Moore. With the score level at 2–2 at the end of 90 minutes, the game went to extra time. In the 98th minute, Hurst found himself on the scoresheet again; his shot hit the crossbar, bounced down onto the goal line, and was awarded as a goal. Debate has long raged over whether the ball crossed the line, with the goal becoming part of World Cup history. England's final goal was scored by Hurst again, as a celebratory pitch invasion began. This made Geoff Hurst the only player ever to have scored three times in a single World Cup final. BBC commentator Kenneth Wolstenholme's description of the match's closing moments has gone down in history: "Some people are on the pitch. They think it's all over ... [Hurst scores] It is now!". England's total of eleven goals scored in six games set a new record low for average goals per game scored by a World Cup winning team. The record stood until 1982, when it was surpassed by Italy's twelve goals in seven games; in 2010 this record was lowered again by Spain, winning the Cup with eight goals in seven games. England's total of three goals conceded also constituted a record low for average goals per game conceded by a World Cup winning team. That record stood until 1994, when it was surpassed by Brazil's three goals in seven games. France again lowered the record to two goals in seven during the 1998 tournament, a record that has since been equalled by Italy at the 2006 tournament and by Spain's two goals in the group stage conceded during the 2010 tournament. England received the recovered Jules Rimet trophy from Elizabeth II and were crowned World Cup winners for the first time. In this World Cup, the national anthems were played only in the final. They were not played in the earlier matches because the organisers (FIFA and the FA) feared that North Korea's presence – a socialist country that was not recognised by the United Kingdom – in the World Cup would cause problems with South Korea. A memo from the Foreign Office months before the finals began stated that the solution would be "denying the visas to North Korean players". The 1966 World Cup had a rather unusual hero off the field, a dog called Pickles. 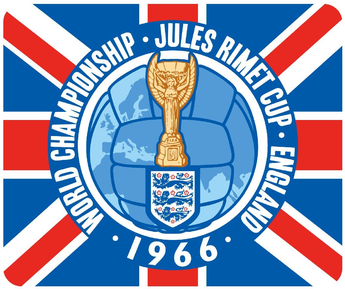 In the build-up to the tournament, the Jules Rimet trophy was stolen from an exhibition display. A nationwide hunt for the icon ensued. It was later discovered wrapped in newspaper as the dog sniffed under some bushes in London. The FA commissioned a replica cup in case the original cup was not found in time. This replica, as well as Pickles’ collar, is held at the National Football Museum in Manchester, where it is on display. World Cup Willie, the mascot for the 1966 competition, was the first World Cup mascot, and one of the first mascots to be associated with a major sporting competition. World Cup Willie is a lion, a typical symbol of the United Kingdom, wearing a Union Flag jersey emblazoned with the words "WORLD CUP". Eight venues were used for this World Cup. The newest and biggest venue used was Wembley Stadium in west London, which was 43 years old in 1966. As was often the case in the World Cup, group matches were played in two venues in close proximity to each other. Group 1 matches (which included the hosts) were all played in London: five at Wembley, which was England's national stadium and was considered to be the most important football venue in the world; and one at White City Stadium in west London, which was used as a temporary replacement for nearby Wembley. The group stage match between Uruguay and France played at White City Stadium (originally built for the 1908 Summer Olympics) was scheduled for a Friday, the same day as regularly scheduled greyhound racing at Wembley. Because Wembley's owner refused to cancel this, the game had to be moved to the alternative venue in London. Group 2's matches were played at Hillsborough Stadium in Sheffield and Villa Park in Birmingham; Group 3's matches were played at Old Trafford in Manchester and Goodison Park in Liverpool; and Group 4's matches were played at Ayresome Park in Middlesbrough and Roker Park in Sunderland. The most used venue was Wembley, which was used for nine matches, including all six featuring England, the final and the third-place match. Goodison Park was used for five matches, Roker Park and Hillsborough both hosted four, while Old Trafford, Villa Park and Ayresome Park each hosted three matches and did not host any knockout round matches. For a list of all squads that appeared in the final tournament, see 1966 FIFA World Cup squads. West Germany were placed first due to superior goal average. With nine goals, Eusébio was the top scorer in the tournament. In total, 89 goals were scored by 47 players, with two of them credited as own goals. Angola and Mozambique represented Portugal. ^ "Hurst the hero for England in the home of football". FIFA.com. Archived from the original on 20 December 2013. ^ "1966 FIFA™ World Cup England – Final". FIFA.com. ^ "History of the World Cup Final Draw" (PDF). Archived (PDF) from the original on 14 June 2010. Retrieved 3 June 2010. ^ "Mundial de Inglaterra 1966 – SIGUEN LOS CHOREOS A SUDAMÉRICA". Todoslosmundiales.com.ar. Retrieved 3 June 2010. ^ Hackett, Robin (7 April 2011). "Blue is the colour". ESPNFC. Archived from the original on 4 February 2012. Retrieved 20 November 2013. ^ "Mundial de Inglaterra 1966 – EL ROBO DEL SIGLO". Todoslosmundiales.com.ar. Archived from the original on 5 June 2010. Retrieved 3 June 2010. ^ "England's 2–1 win brings first final". Montreal Gazette. 27 July 1966. Retrieved 11 October 2013. ^ "ENGLAND PORTUGAL 1/2 FINAL WORLD CUP 1966". YouTube. 27 December 2007. Retrieved 15 June 2014. ^ "West Germany Nips 10 Russians 2–1". Montreal Gazette. 26 July 1966. Retrieved 11 October 2013. ^ a b c McIlvanney, Hugh (30 July 2008). "From the Vault: Hurst's hat-trick wins the World Cup". guardian.co.uk. Guardian Media Group. Archived from the original on 6 June 2010. Retrieved 22 June 2010. ^ Reid, Ian; Zisserman, Andrew. "Goal-directed Video Metrology" (PDF). University of Oxford. Retrieved 10 February 2012. ^ "Kenneth Wolstenholme". The Daily Telegraph. Telegraph Media Group. 27 March 2002. Retrieved 22 June 2010. Kenneth Wolstenholme, who has died aged 81, was the voice of football on the BBC for almost a quarter of a century and the author of arguably the most celebrated words in British sports broadcasting, his commentary on England's last goal in the World Cup Final of 1966: "Some people are on the pitch. They think it's all over – it is now!" ^ "World Cup fears over North Korea in 1966". BBC News. 13 June 2010. Retrieved 3 July 2018. ^ "All Star Team". football.sporting99.com. Archived from the original on 30 June 2016. Retrieved 6 July 2017. ^ "Permanent Table" (PDF). p. 230. Retrieved 28 June 2014. Wikimedia Commons has media related to FIFA World Cup 1966.